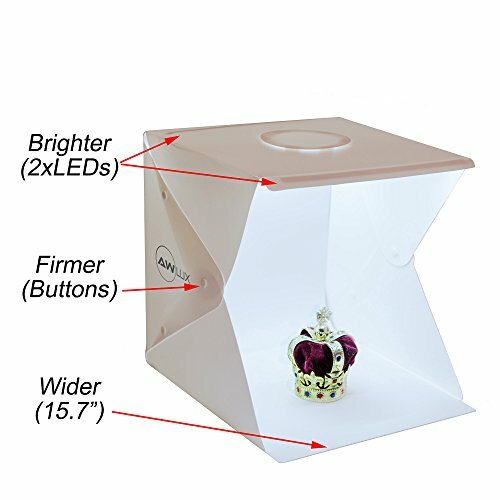 This portable light box is the perfect partner for hobbyists, collectors, and online sellers to photograph stuffs with medium or small sizes, such as jewelries, watches, flower, fruits, cookies, cupcake. It can be carried everywhere and save space when it is folded. Lightweight, portable, and easy to install (thickness after folding is 1 inch / 26mm). Powered by USB: simply plug to a pc, laptop, or power bank. BRIGHTER (2 bright white LED light strips): which emits even and average lighting and prevents shadows and reflections your photos (unlike those with one only light strip which often causes odd shadowing). BETTER SIZE (15.7"x15.7"x15.7"): which is wide enough to take pictures without showing the sides of the box (unlike those with small width which often requires super closeup or post-image processing to not include the sides of the box in the taken pictures). MORE STABLE STANDING (3 button design): with the latest button design, the box stands more stably (unlike the traditional magnet design which often causes the box collapsing). MORE BACKGROUND OPTIONS (4 backdrops: white, black, green, red): which fulfils the needs of most product photography. WIDE APPLICATION: Ideal for photographing stuffs with medium or small sizes, such as jewelries, watches, flower, fruits, cookies, cupcake; particularly suitable for hobbyists, collectors, and online sellers. If you have any questions about this product by AWLux, contact us by completing and submitting the form below. If you are looking for a specif part number, please include it with your message.